Doyle Somerby has heard the message loud and clear: He and his teammates are underdogs on Friday. The senior defenseman and captain of the No. 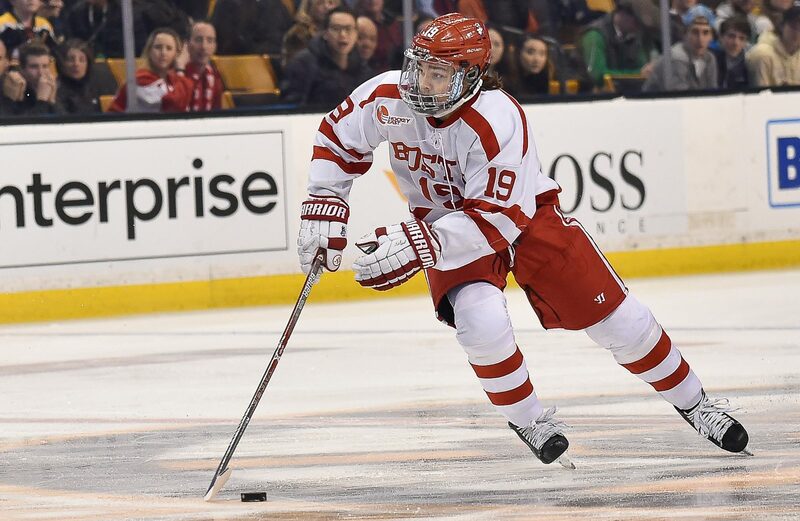 6 Boston University men’s hockey team doesn’t like it one bit. Kindling the flames even further will be 5,000-plus North Dakota (21-15-3) fans, all hoping for the program’s ninth national title. The Terriers (23-11-3), however, aren’t letting the noise — Fargo is 80 miles south of North Dakota’s campus in Grand Forks — muddy their hopes for the sixth national title. While the noise is guaranteed to be stifling, fans in Fargo and those watching on ESPN2 will be treated to 21 NHL draft picks — 11 from BU and 10 from the Fighting Hawks. 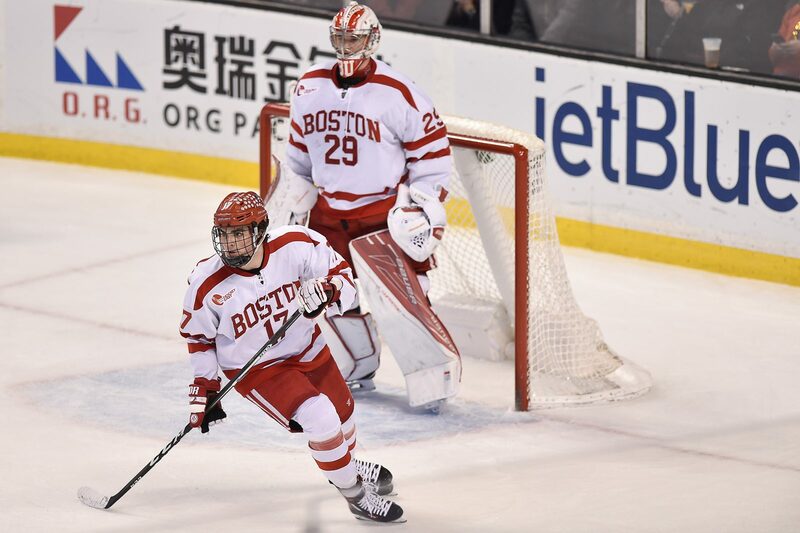 The player to watch from BU, the youngest team in college hockey, is freshman forward Clayton Keller. The Hockey East Rookie of the Year — also an Arizona Coyotes first-rounder — has 42 points on the year and is seventh in the nation with 1.45 points per game. He’ll be aided by other stars ranging from sophomore defenseman Charlie McAvoy (Boston Bruins) to freshman goaltender Jake Oettinger (a likely first-rounder in 2017) to freshman forward Patrick Harper (Nashville Predators) and more. The key for BU, though, Quinn said, will be turning all its talent into a 60-minute performance. Quinn was referring to BU’s slow starts, as the scarlet and white have allowed the first goal in each of their last nine games. Sophomore forward Jordan Greenway, however, doesn’t feel that’ll be a problem, especially with a Frozen Four berth on the line. Obstructing that path will be head coach Brad Berry’s squad, one that allows the nation’s second-fewest shots per game (24.7) and can score in bunches (3.18 goals per game). Leading their charge up top will be Brock Boeser, Tyson Jost and Shane Gersich, all of whom have surpassed the 30-point mark. Then on defense, keep an eye out for Tucker Poolman (30 points) and Gage Ausmus, as well as goaltender Cam Johnson, a finalist for the Mike Richter Award in 2016. For junior defenseman Brandon Hickey, the myriad of challenges NoDak poses are all welcomed with open arms. Whichever way Friday’s game is spliced, the fact remains: the winner will advance to Saturday’s West Regional final, also held at Scheels Arena. They’ll take on whoever emerges from the other semifinal between No. 3 University of Minnesota Duluth and No. 14 Ohio State University. Before then, Somerby said BU has adopted an “us against the world” mentality, and Quinn harped on several coaching points when previewing the encounter. He highlighted winning puck battles, creating havoc in front of Johnson and making mature decisions with the puck. And, if all goes to plan, BU will return to Boston with a Frozen Four to prepare for, instead of the end of the 2016-17 season. It’s going to be a very tall order for the Terriers, but I like their positive attitude.